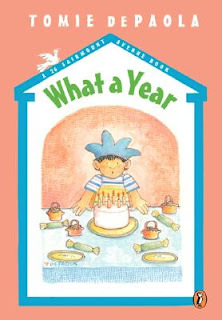 IndieBound Description: The year 1940 is a very big year for Tomie-it's the start of first grade, and it's his first birthday in the new house at 26 Fairmount Avenue. It's also the first year that Tomie gets to go trick-or-treating with his older brother, Buddy. Then the holidays arrive, and Tomie has a part in the Christmas play. This Christmas is going to be great! But disaster strikes when Tomie gets the chicken pox. Will he be cured in time for the Christmas pageant? Join Tomie dePaola once again as he takes us back to his childhood and allows us to share the holiday season with his family and friends. My thoughts: I adore the Tomie dePaola's 26 Fairmont Ave books. Not only do I think the writing completely captures the voice of an authentic child, they describe events that are so much in a child's world & interests. These books were a large influence and inspiration for my Year of the Dog & Year of the Rat (and upcoming Dumpling Days!) books.